Elissa is a Georgian native and received her Bachelors of Exercise Science from the University of Georgia and her Doctorate of Physical Therapy from Georgia State University. Elissa enjoys treating a wide variety of orthopedic conditions utilizing hands on techniques, therapeutic exercise, and functional activities. 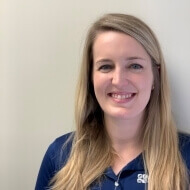 Elissa strives to empower each patient to be able to take ownership over their care and believes in the importance of home exercise programs and patient education. In her free time Elissa enjoys running, exercising, and spending time with friends and family. Elissa treats patients in the Swampscott clinic Monday through Friday.